Angry? Samoan? Tune in to DJ Pauli B RIGHT NOW!! Fukn Angry Samoans -- a welcome noise! With absolutely no disrespect, this is perfect cleaning up the garage music. I’d like to request “Staten Island Ferry” by The New Dorp Dolls. In case you aren’t familiar with it, it’s to the tune of “Subway Train”. @Todd The ferry doesn't go to New Dorp, you Staten Ignoramus! 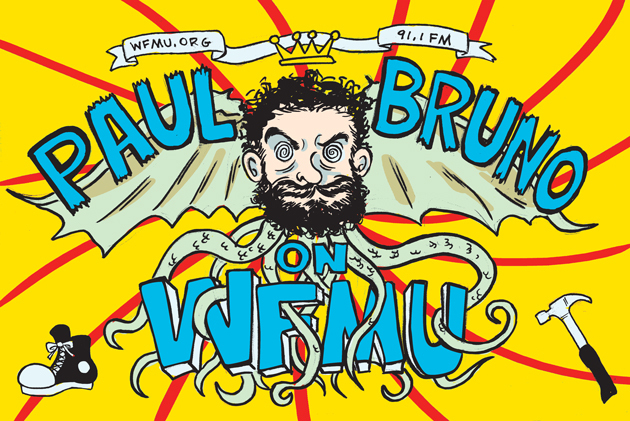 Two weeks in a row on wfmu!! The demand is high! Paul, you are on one winning streak with this set! Apparently, I'm one of the few who hadn't heard about The Crunch. Thanks for your kind words everyone! And for listening! @Stashu: Did you know that Will is on that Sha La Das record? I bet you didn't, so I'm glad I got to be the one who told you. That was The American Dream, right? Love that clip! Hiyo, Paul Bruno. Having a good time in the studio this afternoon? Paulaphonic Paul! Good to hear ya and your rekkids. Great show today, Paul! Always nice to catch your fill ins. Thanks for the shout-out, Paul - Great show! I was distracted by a customer's request for a nice, dry Rosé but I heard the mention in the background; now can I request a nice robust tune that goes well with a full bodied, robust red? Wish we could change to a 27 hr day because Paul needs his own show! Great listening today. Thanks for listening and checking in with your comments everybody! It's much appreciated!! Wow, GREAT fill-in, Paul! Love! "Unbelievable Guy"! Yeah! Bob Crewe rules!! just caught your fill-in from last Sunday last night = great radio, now again today live - thanks very much! !